After a quite start to 2017, finally we have our first major freshwater trip of the year. An expedition along the Royal Bloodline as I like to call it. Fishing along the main river of Royal Belum known as Sg Perak, that serves as the main source of life that has created the main Temenggor lake over the course of tenth of years ago. We were toying with an idea to head upstream in Jan along the Belum main river back in Aug 2016. Finally, after months of preparation, we’ve got our date 23rd to 26th of Feb. There is always a risk to head upstream during the early part of the year, mainly the east coast monsoon will be our enemy. Even data from Windity suggest that there will be scattered rain along the northern part of Royal Belum. We brace ourselves for the worst possible outcome and set our target to a place called Sungai Ketir or also known as Jeram Ketir or Ketir Rapids. Its a special place with 3 stage of rapid which are not found anywhere else along the main Royal Belum, Sg Perak stretch. Back in 2013, we embark on a similar journey, commemorating Fishyology 2nd year anniversary. 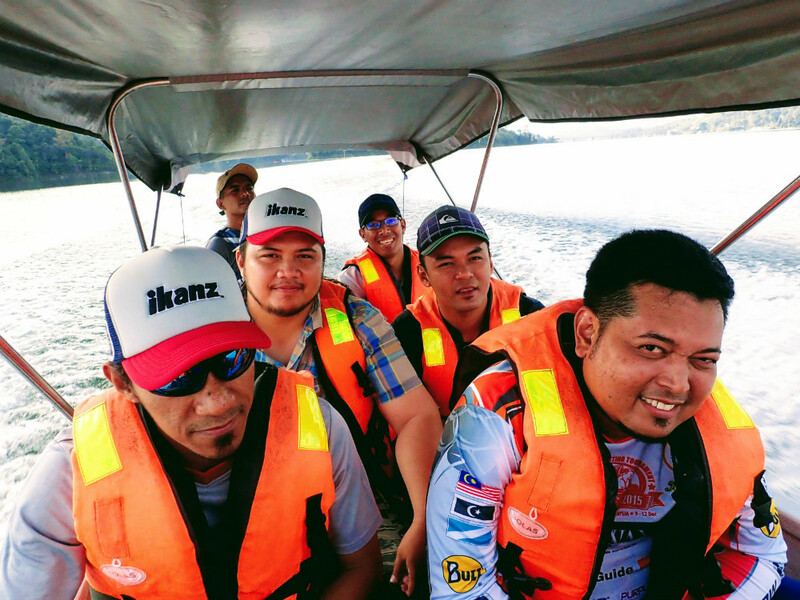 Thanks to Azrul Fahmi dedication to setup a trip to Jeram Ketir, 8 prolific anglers signed up to the task. Myself, Azrul, Saiful, Haszuan, Fitri, Megat, Radhi and Mahfudz are set to embark on a life changing journey. 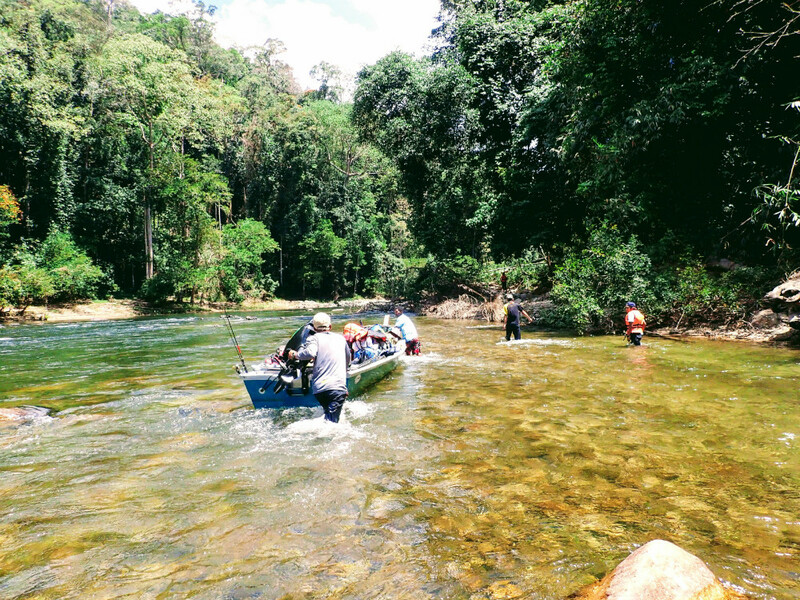 Jeram Ketir is considered as a special place, as it is the only section of the main river that flows into the Temenggor lake which has 3 major high rapids. 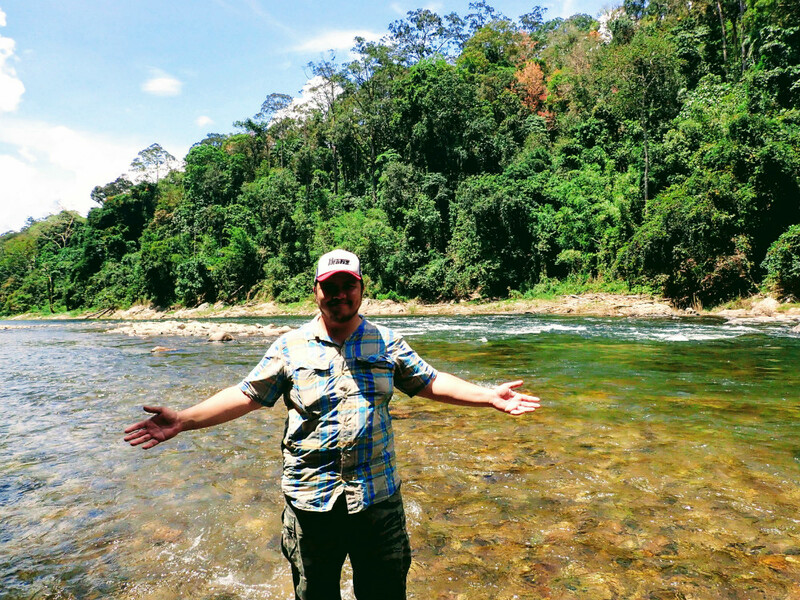 A great place to catch 3 kings of the mountain river, the Notorious Sebarau, the Stealthy Copper Mahseer and finally Malaysia’s prized game fish, the Malayan Golden Mahseer. Before we could even imagine fighting one of the 3 kings, getting there will be the main challenge. Each of us is required to packed all our necessities including our food supply, tackles and personal item. Not forgetting that each of us will be carrying 3kg of fermented palm oil kernel as bait. 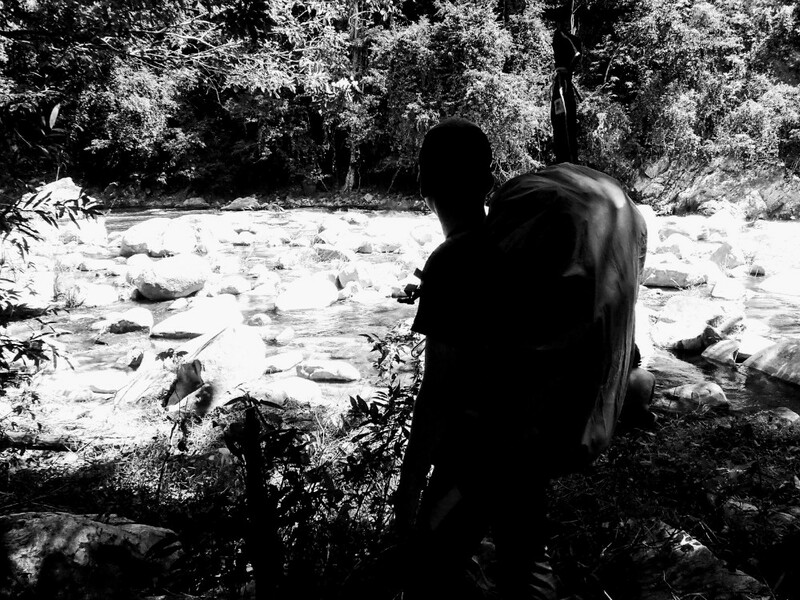 By the end of the day, 30kg-40kg backpacks will be carried on our backs, and walked 12km from the Sungai Kejar Base Camp. The first section from Sungai Kejar to Jeram Ketir, I would say about the first 5km is a challenging path. Maneuvering along a steep and narrow pathway with fast flowing river just meters away from our feet. The jungle was quite dense and the pathway were slippery at times. This are some the challenges that are running through my head, weeks before we even hit the road. Beyond the slippery pathway, there is a place I liked called “The Walk of Faith”, where each of our balls will be tested to cross a huge tree. Once we crossed the fallen tree, the pathway was ok, with 5 more hills to climb before finally reaching our main destination. It does fills good to be back, after a slow outing with Mr Thinesh and Friends back in January. 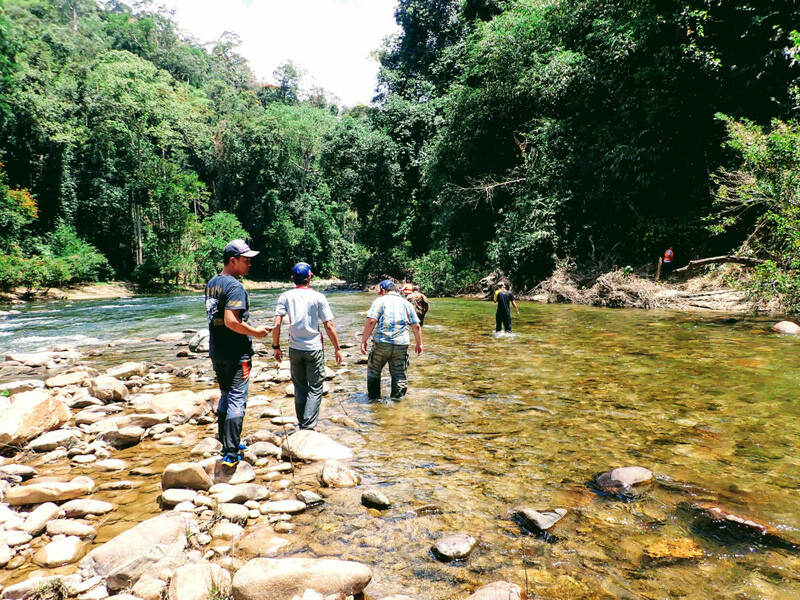 We were there on the morning of 23rd Feb. Our upstream guide will be Mr Bukhary Gerik. 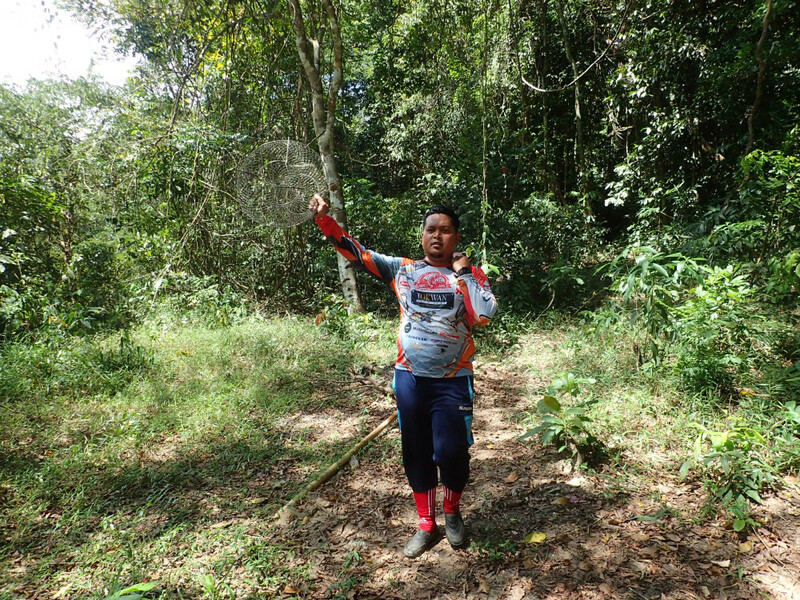 He is one of the new comer in guiding groups to Royal Belum Upstream Fishing with at least 10 years of experience. We depart from the temporary Public Jetty by 9.00am and make our way up to Sungai Kejar Base Camp. It took us an hour to reach our walking point. Along the way, we came across Rambo. A native guy who belongs to the native community of the Jahai people. He will be coming along and will meet up at Sungai Kejar Base Camp. Along our 1 hour journey, it is filled with beautiful sighting of Royal Belum. This will be Mahfudz and Fitri first ever trip here and it is always a pleasure to share them some basic info about the place. A boat that are filled with 8 pax can be quite cramped haha. We barely had enough sleep and I did try to catch a quick nap but its not ideal. Finally we stopped and rest at the Sungai Kejar Base Camp. We were waiting for Rambo to finish his errands at the main Jetty before meeting us here to proceed to Jeram Ketir. The water level was higher then what we experience in August. About 2-3 meters higher, or even more. 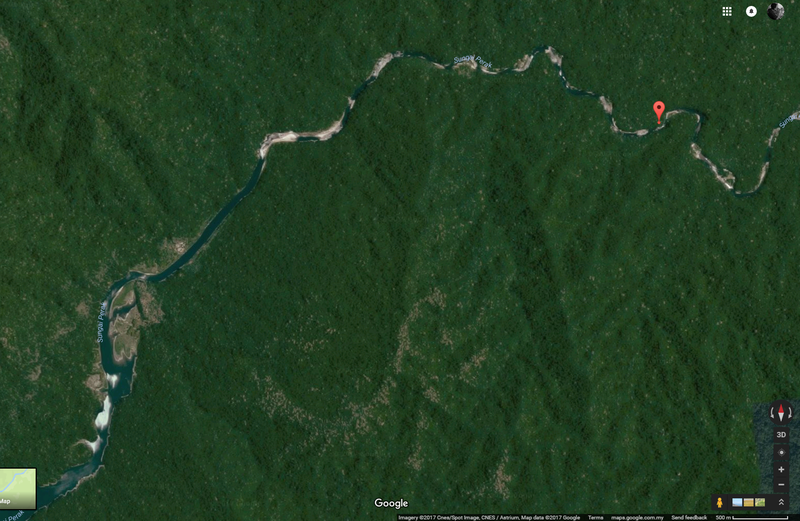 This provides us an opportunity to travel further up river via boat before we set on foot to the intended location. It could save up 1-2 hours of traveling via foot. A great travel discount and thankfully with heavy backpacks on our backs, this is a welcome sign indeed. 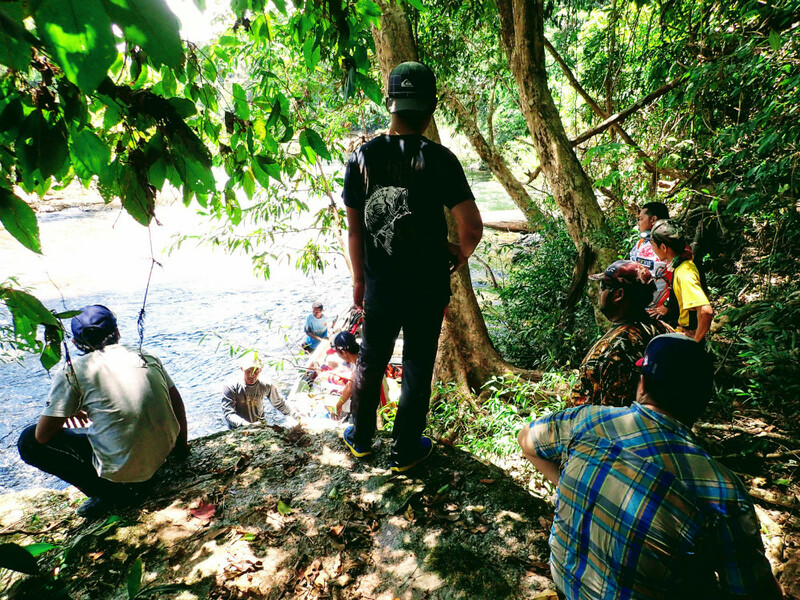 Rambo appeared in the far horizon of the Sungai Kejar Base Camp. It’s time to get ready for the long journey ahead, which takes us at least another 3-4 hours. We maneuver along Sungai Perak, and head further upstream. We did pass several rapids, but thanks to high water level, we manage to pass the area via boat. We reach at a point where we need to travel via foot. 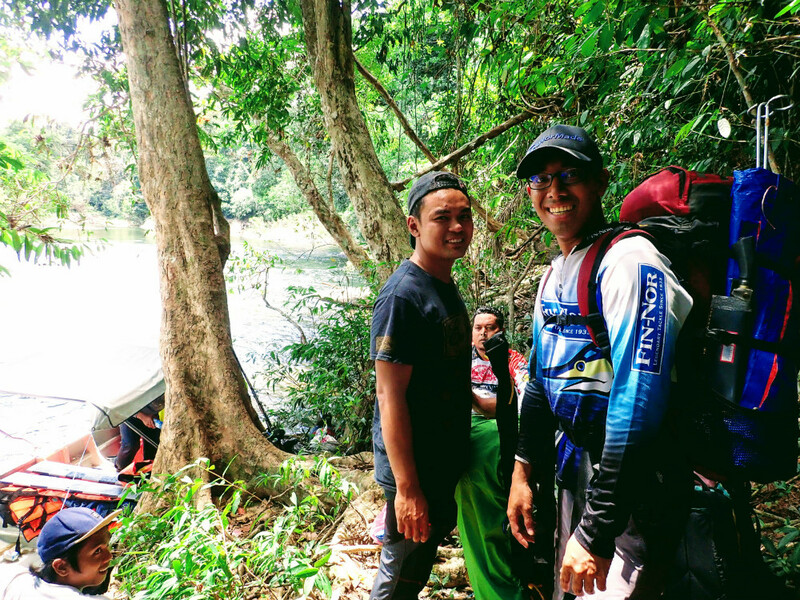 The boat dropped us at a river bank and soon we found our way via the normal Sg Kejar-Ketir route. A pathway in the middle of the jungle, used mainly by humans and Royal Belum wildlife. Although the jungle is wide and vast, most of its inhabitants will stick to one or two main pathway. An amazing fact not known by all men. That means you are likely to came across Belum’s wildlife like Elephants and the Malayan Tiger. Bukhary and Rambo still travel upstream with our stuff via boat. Daunting task up ahead as they need to push the boat across the fast-flowing rapids. I tried it once back in Aug, it drains your energy faster than you think. In this situation, endurance is the main key. We all must walk at a steady pace in order to reach our target destination at a pre-determined time. 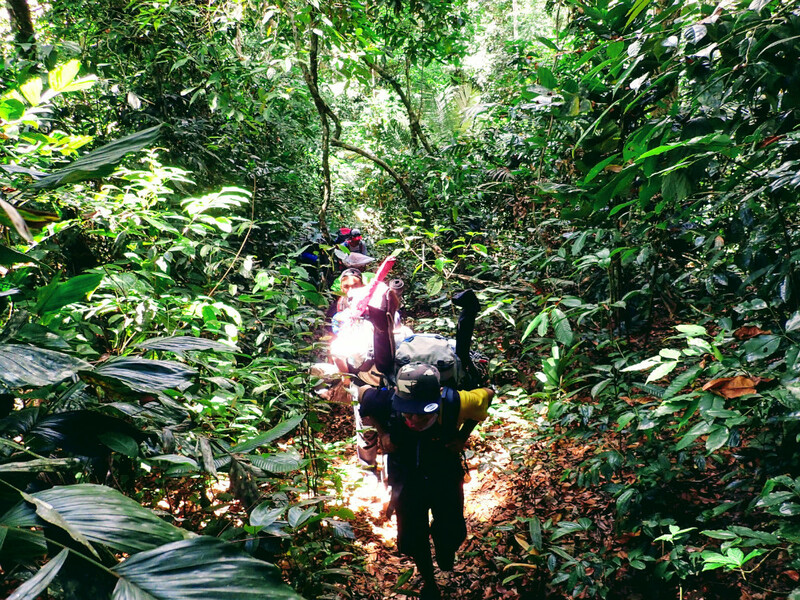 With our backpacks, safely in our boat, walking through this thick lush jungle was a breeze. 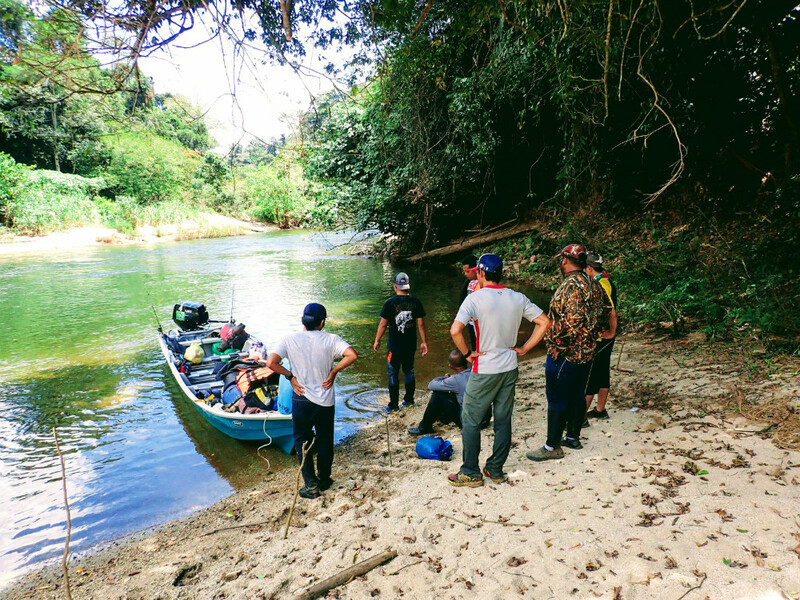 We cross the main river twice and via foot before finally reaching the most significant point of this journey to Jeram Ketir. Our 12km walk begins, if only we had rods on our hand. We might not make it to base on time. Bukhary and Rambo, pushed the boat along the shallow rapid. What is not to love about Royal Belum? It seems the boat can move further upstream. 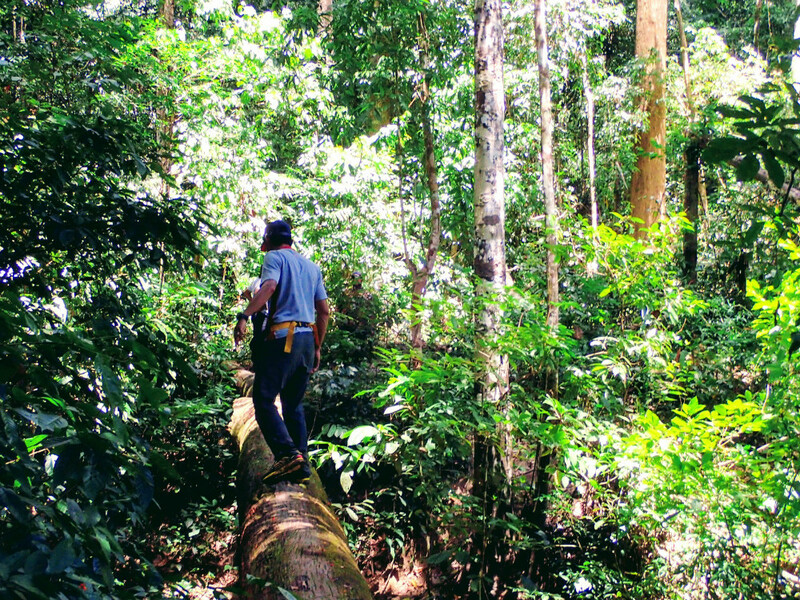 I liked to called it “The Walk of Faith” where we need to cross a century old log that crosses a small creek near a place called Lubuk Jerai. Named after a huge Jerai Tree which is one of the best spot for bottom fishing. It is about 10-15m in length. 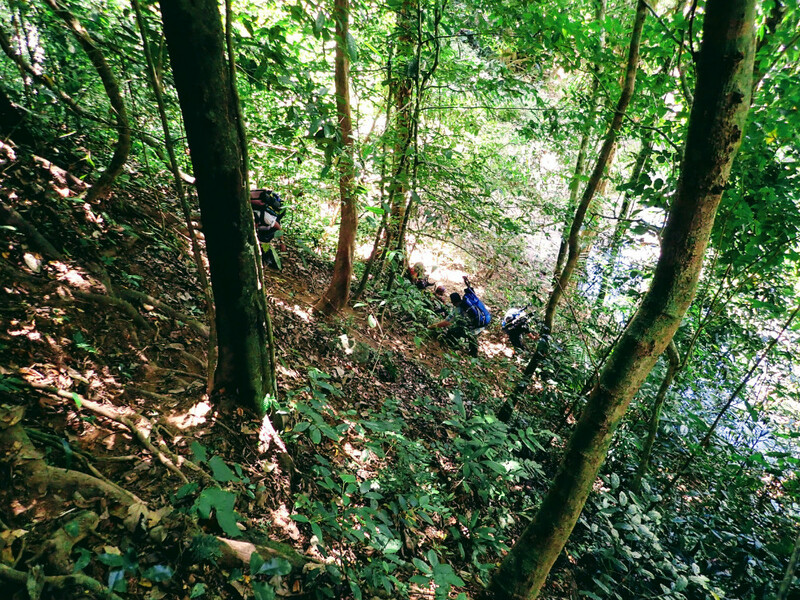 One by one, we walk across it to reach the other end of the steep slope. We must have faith to crossed it, as one wrong move would either brake our leg and end our adventure at the spot. It’s a gut wrenching experience but finally we all made it safely to the spot. The boat is still behind us and we keep walking about 10-15 minutes before we heard a calling from the distance. We need to back track and pick up our stuff as Lubuk Jerai will be the end of traveling via boat. It’s a long way back and we are all tired. To make it even worse, 30kg backpacks are ready for our back. Still we pick it up and travel up to our spot. Azrul slowly crosses the fallen log. We climb up this hill, only to find out that we need to back track for our bags. A century old log overhanging on top of Fitri's head. The pathway onward to Jeram Ketir were slightly elevated as we need to climbed up several small hills. One moment along the journey, I try to crossed a small creek but fell because I couldn’t balance myself properly. Stuck my feet in a 2 ft mud and lucky I didn’t lose my shoe. Keeping your shoe as dry as possible is essential for jungle trekking. Although highly unlikely its achievable, this is an important factor to ensure a steady pace on foot. Balance while walking along a hilly pathway is important to keep ourselves away from falling and injury. Another moment, which we need to travel down a very steep hill with only the tree roots for us to hold on too. 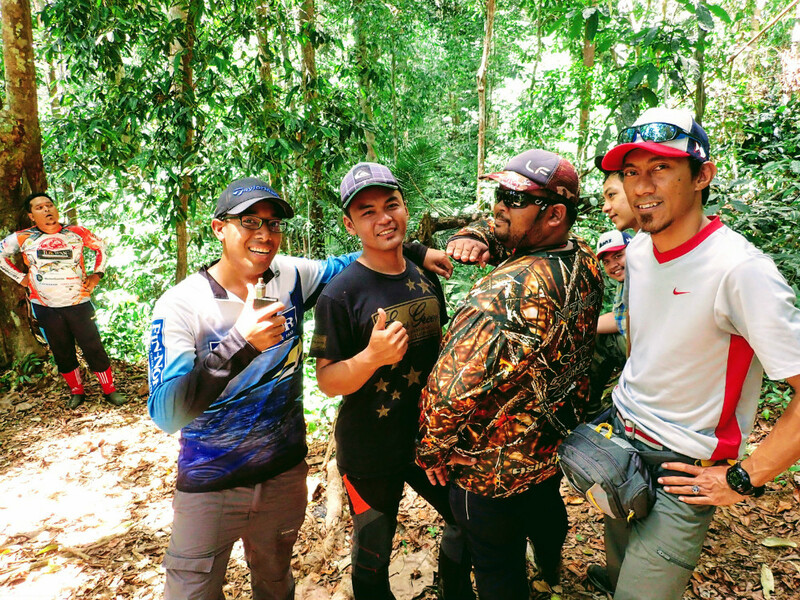 Saiful and Haszuan were the first too to travel down. 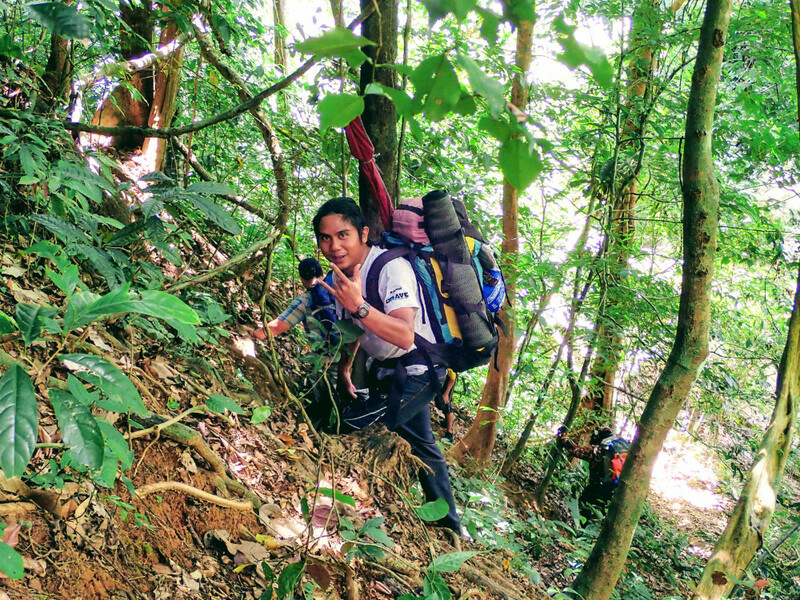 Saiful almost lost it as his heavy backpack pushed the balance forward and risking him falling on his face. In that critical moment or I should say life threatening moment, we automatically found the extra strength to balance ourselves to avoid it from happening. I too almost lost it on the way down, as one of my hands were holding a rod holder and pack of 3kg Palm Kernel for bait. I just throw it down, grab on the roots and walk down safely. Discount is over! Time to pickup our bags! Mahfuz keeping a positive mind to elevate some of the weight off his bag. 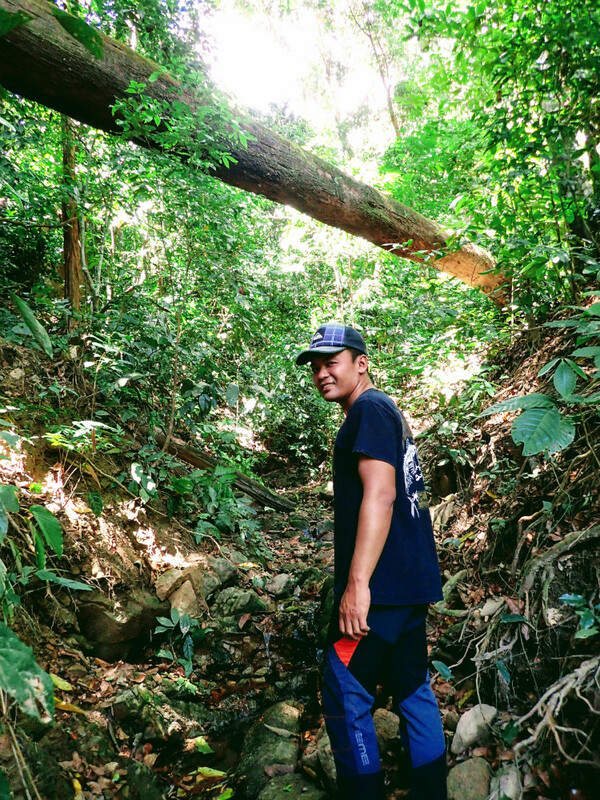 A Jungle Pathway that will take us to Jeram Ketir. Radhi take a quick break, before climb down a steep ledge. A long way down, only tree roots to keep us from falling on our face. After all members went down, Megat found himself in a bad position. Due to his health, which we all knew on that day has sucked all his energy. He was not able to stand up on his feet and his face are all white. A very worrying sign as we are already halfway through. Rambo picked up his bag, and all he need to do now is to walk and reach the destination. We carry on hoping Megat will be able to make it. We pace ourselves and keep on walking. It felt like a never-ending walk, we find bit of strength and motivation to push ourselves. We were at the edge, but finally we heard a water crushing down on the rocks. “This is it”, I told myself that Jeram Ketir is right at the corner. Megat scares us for while but finally he made it! All the pain we endure finally came to an end. Now Adrenalin takes over as we are gearing up for some good fishing! We pushed on, went down-hill and finally reach an open area with white sand by the river bank. Jeram Ketir!!! I couldn’t believe myself that I can walk this part of Royal Belum again. It is such a great feeling, brings to many good memories here. Last time we camp out on the sandy beach, but this time we travel 100m more to reach our camp site which is close to Sungai Ketir. A small rocky river that flows into the Royal Bloodline. We setup camp, and now there is a temporary kitchen for us to cook and place our food supplies. We all will be sleeping on a ground sheet, with a fly sheet attached above our head to keep dry from rain. Megat and Bukhary already starting to cook our lunch. The rest of us couldn’t wait to get our lures on the water. We get things ready and hit the road again to catch our Sebarau. At that point, all the pain and tiredness are gone. Radhi were the first one to catch a Sebarau but lost it in the end. It was a small one but it’s a good sign. I travel further down and cast out along the river bank until we reach the beach area. No Sebarau. 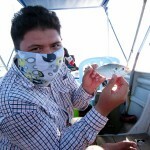 Fitri came by and he caught a good size Sebarau, even Mahfudz caught one further up. One thing for sure is that water clarity was crystal clear, which have hampered any good fishing. The fish will be able to avoid us and our lures. Right about the end the day, rain drizzled down and we all head back to base camp. Nothing more that we can do in Day 1. We had our lunch and simple dinner and sleep early that night. It was still drizzling at night and trust me it will be very cold. It didn’t take long before we doze off and hoping tomorrow will be a start to great fishing day.